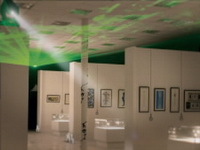 On December 9th, 2008, Moscow will see the unique Mystery of the World’s Calligraphy exposition specially compiled on the occasion of the opening of the Contemporary Museum of Calligraphy. A rare piece of conceptual blending, the exposition will reveal the intricate harmony of music, light, and handmade lettering; the unity of Nature and human thought; the hidden powers of fire, water, and air will fuse with those of the spirit and the word. Representatives of various calligraphy schools from 26 countries will overwhelm you with 250 masterpieces. The exhibition space is specially designed to envelop you into the concord of image and music, creative mood and exalted spirituality. You will plunge into a different reality as soon as you pass the threshold. The exhibits on display attest to the overall diversity of the collection: spatial video performances, real fire and water, flower fantasies, calligraphic installations, exquisite items of applied calligraphy, ancient manuscripts, rarity letters, exclusive handwritten miniature books, writing utensils of the past and present, etc. All this will urge you to discover the hidden meaning of the ancient art of calligraphy. The exhibition will be featuring the first and only handwritten copy of the Constitution of the Russian Federation to be premiered on the occasion of the 15th anniversary of the adoption of the Fundamental Law of the Russian Federation. Special attention should be paid to a collection of thirty-five miniature constitutions including a rare edition of the 1921 USSR Constitution, and US presidents“ inauguration speeches. You’ll enjoy a unique opportunity to watch inauguration ceremonies and read through the oaths of office of: Boris Yeltsin, Vladimir Putin, Dmitry Medvedev, John F. Kennedy, Theodore Roosevelt, etc. The cultural and educational programme will take your breath away. The best artists will demonstrate their skill at a series of master-classes. Fascinating tours for parents and children alike will be launched every half hour. Moreover, the organizers have promised to shock people with more surprises than they can take.